When Quiet Beckons • Run Hard. Rest Well. 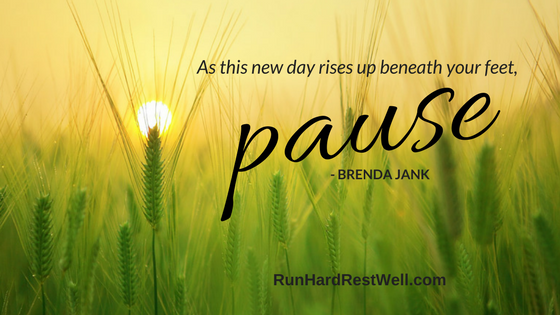 Allow the invitation below to shape the pace and direction of what lies before you today. The following excerpt is taken from Jesus Calling, by Sarah Young. Emphasis is mine. Come away with Me for a while. The world, with its nonstop demands, can be put on hold. Most people put Me on hold, rationalizing that someday they will find time to focus on Me. But the longer people push Me into the background of their lives, the harder it is for them to find Me. You live among people who glorify busyness; they have made time a tyrant that controls their lives. Even those who know Me as Savior tend to march to the tempo of the world. They have bought into the illusion that more is always better: more meetings, more programs, more activity. Thank you for sharing this – just what I needed this morning. His timing reminds us just how much He cares about us. Thank you Brenda. I hope the world can quiet as well. Feeling very overwhelmed by it all. Hi Deb, The “quietting” of our hearts … what a gift. He meets us in those places. Powerful. As I await results from a test, I have been given the choice….stew, wait, or pause, trusting God’s timing. I call. Results not back….wait until Friday. Ok. So what now? Pause. Add Jesus to my day and receive His peace, His marching orders, His attention.